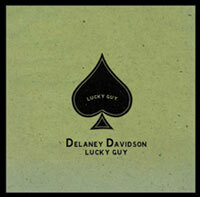 "One of the most realised and strongest thematic offerings he has released"
“Lucky Guy”, Delaney Davidson’s latest release, is a compact set of 12 songs. Recorded in The Lab, Auckland and mixed in New York with Matt Verta Ray (Heavy Trash), it is an uncharacteristically contained and succinct release. Used to the unavoidable sprawl of time and the ramble of his tours, Davidson avoids the technique of collation, curation and compilation that is what we have become used to from him. Featuring (typically) a demo version of one song (Give Me Your Hands ) as well as one recorded during his European tour on a day off in Geneva (a classic take of Dorsey Dixons “Wreck On The Highway”), The songs reflect life as a musician, leaving a lot of the storytelling behind for real life observation. Suburban soul pop classic “You Don’t Want Me Around” and Friday night rhythm and blues flavours of “Tell It To You” sit next to maudlin glam travel ballads “Eastbound” and “Wait” - winner of the Worlds Saddest Songs competition Berlin 2010.